What would you do for the secret to doubling your blog traffic and leads? While you might be willing to pay an arm and a leg, the secret to more traffic and engagement is easier than you think. You’ve probably seen all of the stats about how blogging for business can improve close rates and increase the number of indexed page, so I won’t bore you with more, but instead, let’s think about this question: how much of your website traffic is coming from articles that are older than 6 months? And is this content you would be happy about people discovering today? To drastically improve the number of monthly leads and increase organic search, you’ll need to implement historical optimization into your blogging strategy. By implementing this tactic, HubSpot was able to increase the conversion rates on their posts by an average of 106%. Not only is historical blog optimization a way to get more out of the content you already have; but it’s also a way to get a leg up on such a competitive content landscape, by keeping your content evergreen, and delivering even more value to the people reading it. This tactic performs well with old content simply because the content has been indexed for much longer and already has some authority in Google, which in turn will make it easier for your optimized post to gain traction and start moving up the ranks. The whole idea behind historical optimization is to identify under-performing content (i.e. highly-viewed, but low-converting or high-converting, but low-viewed pages) and improve those articles so that they’re fresh, up to date, and have the ability to generate even more traffic and conversions. If people are going to find your older content through search engines, it’s important to ensure that the content is relevant, accurate, and a realistic representation of your organization’s current expertise. To add more context to the conversation and the importance of optimizing older articles, roughly 85% of IMPACT’s monthly blog traffic comes from old posts rather than content that’s been published in the last month. Let’s be honest. If you look back at the content you created two, three, even four years ago, I’m sure you’d cringe. You would never think about using that content in an email today, so why is it okay for your audience to be able to stumble across that piece of content and more through a simple Google search? By updating old posts you’re able to make sure that you’re always putting your best foot forward and build off the the existing search authority the post already has, rather than starting fresh. Stop neglecting your old content, and take advantage of the rank and authority it has. All you need to do this is time and a little elbow grease. To help you update and optimize your old content, we’re going to walk you through identifying which blog posts you should optimize and how you should go about optimizing them. If you have hundreds or even thousands of blog posts like we do, you might find it hard to identify where you should start diving in. 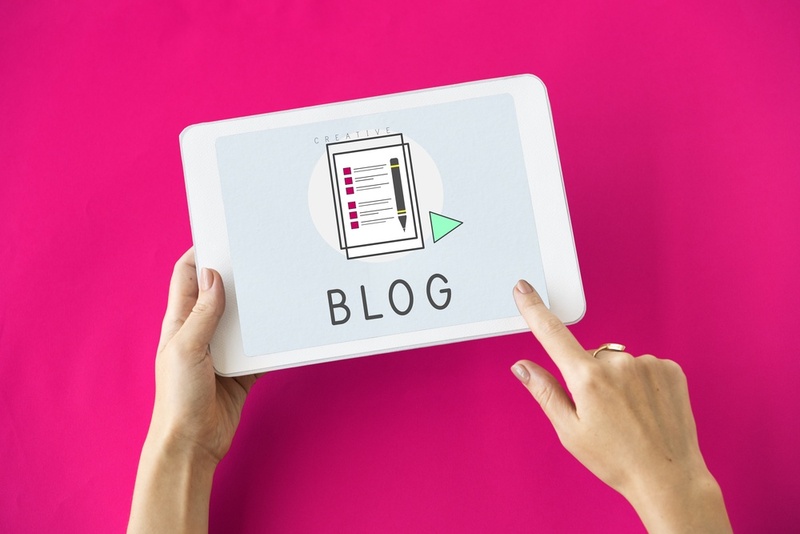 Now that you know what to look for, here are two methods you can use to identify what blog posts you should start optimizing. If you’re using HubSpot, you’ll want to export your blog analytics for the last 30 days (including columns for views and click-through rates), and then remove anything that was published within the last 6 months. This will give you a significant portion of content that you can start digging through. Now that you have your list of articles, you’ll want to sort them by post views from highest to lowest. After everything is sorted, start digging deeper into the posts that have a good conversion rate or have decent amount of traffic. If the post has a good conversion rate, you’ll want to focus on improving the traffic to that post. If the traffic is good, you’ll want to focus on maintaining that and optimizing it for conversions. Regardless of what approach you’re taking, once you’ve found your posts, you’ll want to identify what keyword the article is ranking for or could be ranking for. This will give you more insight into what keyword your post is ranking for and how your CTA is performing. For the second method, I recommend looking for keywords that are currently ranking somewhere on page two or three of search results or have a ranking somewhere between 7 and 30. These keywords are the ones that have the potential to rank on the first page of search results as they already have some authority. 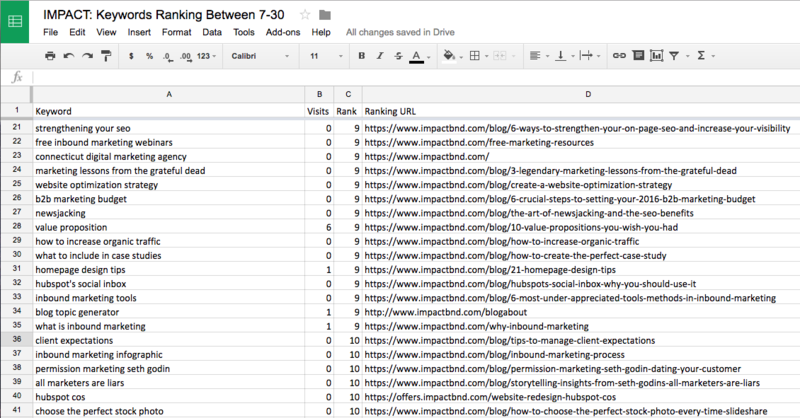 If you’re using HubSpot, export your list of keywords and open the document in either excel or Google sheets. Once you’ve opened the document, sort the data by Rank and remove everything with that rank that’s lower than 7 and higher than 30. After you’ve narrowed the keywords down, scroll through and look for ones that have a decent amount of monthly searches. Now that you’ve identified a keyword, you’ll want to copy and paste it into Google to see what blog article is ranking. No matter what method you’re using, once you’ve identified a list of articles that you want to historically optimize, it’s time to start updating them. Here are some best practices you should consider. Now that you’ve identified what articles you should tackle, it’s time to roll up your sleeves and start making updates. What is the searcher's intention by searching for the article’s target keyword? Does your article meet their expectations / intention? Does it answer their questions? Where does it rank amongst other companies competing for that keyword? What are the other companies doing that you can do better? How can you build upon what they have and move into the number one spot? The whole idea behind updating and refreshing you content is to ensure that your older posts are current and relevant to what your readers are looking for and that it delivers more value than your competition. To make sure that your content is optimized for conversions and search, you’ll want to focus your efforts on updating these major sections of your article. When you initially published the article, it was okay for the word count to be somewhere between 300 and 500 words. However, that is no longer the case. Today, the word count for high-performing content that is ranking in the top 10 of results is closer to 2000 words. With that in mind, when you’re looking through the article, identify areas where you can provide more value and context. This is especially true for articles with titles such as “5 ways…” or even “10 reasons…” that were published with a word count of 500. When you’re updating the article’s copy, also consider taking a look at what your competitors are talking about. How are they ranking on the first page? Use that information to make updates to the copy that align with the reader’s interests and goals and will help you out rank the number one article. To keep your readers engaged make your introduction is compelling. Otherwise, all your optimization efforts will be forgotten. P.S. 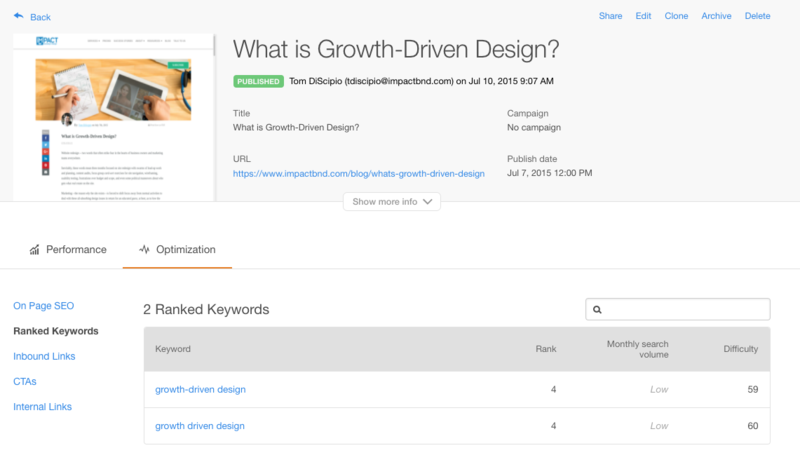 Don’t forget to include your target keyword naturally throughout the content and your CTAs. How are your CTA performing? Like I mentioned above, by looking at the optimization tab pertaining to your article’s performance, you can see exactly what CTAs are on your article and how well they’re converting. If you’re CTAs are getting a lot of views but not really conversions, you might want to consider the language of the CTA and whether it fits the reader’s goals. Is that something they’ll want to download and keep reading? Maybe the offer is a great fit, but it’s the CTA copy that is preventing anyone from converting. Don’t just have a CTA with general copy that may or may not match what the reader is looking for. Instead, adjust the CTA text to include the target keyword or the text your reader’s used to find the article. Implementing this change will ensure your CTAs resonate better, and you might even find that you’ve doubled or tripled conversions. The in-line CTA should also send your readers to the same offer that’s promoted at the end of your post. Sending people in different directions can just be confusing and overwhelming. Focus on one key offer. When it comes to adding links to your article, it’s critical that you include at least 2-4 links to the offer landing page in the first 350 words of the article. Also, after 350 words, include 3-5 more links to the offer or related pages, and as needed add external links to reputable data sources, examples, etc. Now that you’ve updated your copy and made adjustments to your CTAs and internal links, it’s time to do a final check of your article’s SEO. Was your title compelling? If not, you might want to consider updating it (keeping the focus keyword, of course). Bear in mind, if you make the decision to change the title, don’t make the mistake of updating the URL. While updating the URL will be tempting, it’s important to keep it the same to ensure you don’t remove any value the link currently has. It’s also never a bad idea to look over and make improvements to the meta description. This is important for improving click-through rate from search result pages. To create a compelling meta description, you’ll want to keep the as close to, but not over 155 characters and your primary keyword should be included. Also, your meta description should tell the searcher why they should read the article. Just like you included your focus keyword in the title and meta description, the keyword should also be in your headings, where it’s applicable. Furthermore, don’t forget to include an editor’s note for transparency at the end of your post. This will prevent any confusion your readers might have if they see blog comments from two years ago, but the publish date is current. When you’re making a change to any part of your marketing, it’s always a good idea to track the progress and identify how effective it was. Just don’t forget to track your articles “before” stats prior to publishing the new content.